Branding is big! Very big!! And that means that many businesses will do everything they can to make sure that their brand is promoted to the right people, at the right time, and in the right way. Think just how big iconic and deeply ingrained brands like Coca Cola, McDonalds, Facebook, Virgin and Google have become. Much of each of those companies success can be put down to how well they have branded their image to the general public over time. So how do business overcome such ad-blindness and get new people to appreciate the products behind their brands? Student Brand Ambassadors / Student Brand Managers work at university campuses in the UK and try to promote a particular company's brand and products to their student friends. For the right sort of person, a student brand ambassador job can be a relatively easy way to make a decent amount of money while at university. And the work experience which shows your marketing savviness will look great on your CV. What Do Student Brand Ambassadors Actually Do? Student Brand Ambassadors, like all brand ambassadors, are there to portray a company's image in a positive way to potential customers of the business. You will have no doubt seen famous celebrities being used by brands to "front" particular products with which they could be associated. Think of products like expensive watches, makeup and shaving products. Celebrities or popular role models are often used by big brands because they want the right people to be associating themselves with their brand. It is exactly the same with student brand ambassadors. Companies who think that students might buy into their brand want popular people who embody the spirit or ethos of their products to pass the word on to other like-minded people. A lot of brand ambassadorship work can be quite passive. For example, a clothing brand might supply you with free items of their latest seasons' range. You simply need to wear them, wear them well - and let other people know about how much you love the brand you step out in around campus. Whatever the role of a student brand ambassador or manager, the aim is the same; to make a brand look attractive to the people you come into contact with so that they have a positive frame of mind. Ultimately, the business wants their brand to spread as far and as positively as possible so that more people will buy their products. So, Can Anyone Be A Student Brand Ambassador? 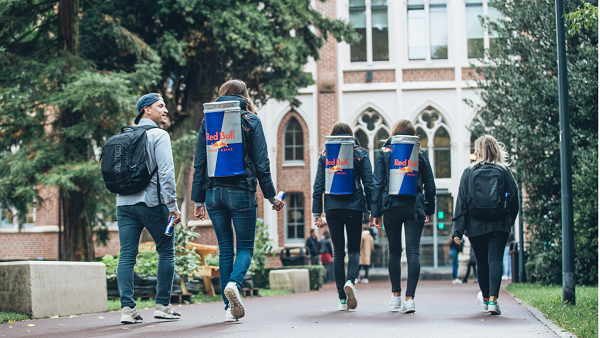 In theory, anyone, at any university, can be a student brand ambassador. In reality, though, as is the case with most other types of work, certain students are going to be much more effective at this sort of job than others. Good networkers with strong communication skills and a passion for brands are obviously good to be ideal as student brand ambassadors. If you are well-connected at university then you are a very strong candidate for companies seeking brand promoters. Are you in sports teams or societies? Are you an active member of the Student Union? Do you spend a lot of time socialising? Are you naturally outgoing? If you have some or all of these sorts of qualities, then companies advertising Student Brand Ambassador roles will want to hear from you. Just University - Or College Too? But there is no reason why brands aiming for a slightly younger audience shouldn't look for student brand ambassadors who are still at college. Many, many products are targeted at young people in the 16 to 18 year old range, so we expect to see a rise in demand for student brand managers and brand ambassadors at college level in the future. When Do Companies Recruit Student Brand Ambassadors? Recruitment for student brand ambassadors can be any time of the year, but many are advertised over the summer months for a September/October start. Some companies look for ongoing student brand managers for the whole year. Other businesses will advertise vacancies for high-demand times or when they release a new product range. That's why it pays to bookmark this page and keep checking back for the latest student brand ambassador jobs that are on offer. Much of student ambassador work is part time on an ad hoc basis during term time when students are actually attending classes and socialising with other students. But, if you are particularly good at selling a brand, then some companies will be willing to continue using your services to keep spreading the message about their brand when you go back to your hometown for the holidays. How Could A Stint As A Brand Ambassador Help My Future Career? The skills you display as a good student brand ambassador are very much in demand by graduate employers. In a role as a brand ambassador, you show that you understand how branding and marketing works. You show that you are a great communicator who knows how to engage with people in a way that will persuade them to feel positively about something. You also show that you are well connected amongst your peers because you are so good at networking. These qualities and skills, plus many more, are just the sort of characteristics that graduate employers are looking for. Plus, you should have already made some very useful contacts at the company's whose branding you've been helping out with. There is every chance that those contacts will remember you and help you get a graduate job with the company when you finish your degree. How Much Do Companies Pay Student Brand Ambassadors? How long is a branded piece of string? It's very difficult to put even a ball park figure on how much you might earn as a student brand ambassador at university. The big companies that can pick and choose between the best candidates can offer some very attractive pay for this sort of work - up to £8 per hour. Other companies might not even pay you anything to promote their products; instead they might provide you with free products for a certain amount of time or up to a certain value. But, as we mentioned above, it's not just the pay you should be interested in. The other great take away is the work experience you can adorn your CV with. Which Companies Look For Student Brand Ambassadors? Well, any company that wants to raise brand awareness of their product to young, educated people. We've seen all sorts of different businesses advertising jobs as Student Brand Ambassadors - indeed, we've advertised many different student brand ambassador roles on the employment4students website. Every sector in the business world wants to have a great brand image so there really is no limit to the sort of company that you might see advertising for student brand managers to help them out. Any company that has a product which they think students might buy will be keen to offer just these sorts of positions at UK universities to students just like you. We have had a real mix of brands from Microsoft to Wild Turkey - the US Bourbon company - recruiting student brand ambassadors through the e4s website. Some Field Marketing companies, such as ODM recruit brand ambassadors to promote brands and products in stores, at events, or on the street. There are also specialist “youth / student marketing” companies such as Campus Group, who hire student brand managers from most universities in the UK each year to run student marketing campaigns on campus for their clients. Their brand managers will promote a number of different brands throughout the year on multiple campaigns, which provides great variety. The student brand manager role is also structured enough to qualify for the Chartered Institute of Marketing award. Start A Brand New Student Job Today! If we've convinced you that you can be a good student brand ambassador then apply now for any current positions below.